This lab will explore the use of pointers in several ways. 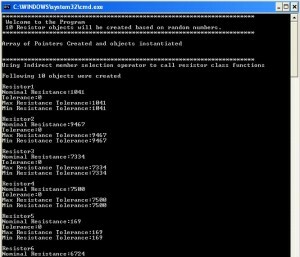 Pointers will be used to dynamically allocate memory for new class objects on demand from the user,Â and theyÂ will be used to access class-member functions.Â Pointer arithmetic will be used to access and sort class objects according to criteria explained in the lab. Pointers are, essentially, address variables, or variables that hold as their value the address of other variables. In terms of memory management, they are very powerful devices, andÂ they more closely and efficiently use the actual internal hardware registers of the microprocessor that the programÂ operates on. Pointers also have the requirement that the pointer type must be of the same data type as the variable, or the dataÂ that it points to or holds the address of. The power of pointers also hints at the potential complexity of their use, which is why this lab is focused almost entirelyÂ on several different aspects and uses of pointers. 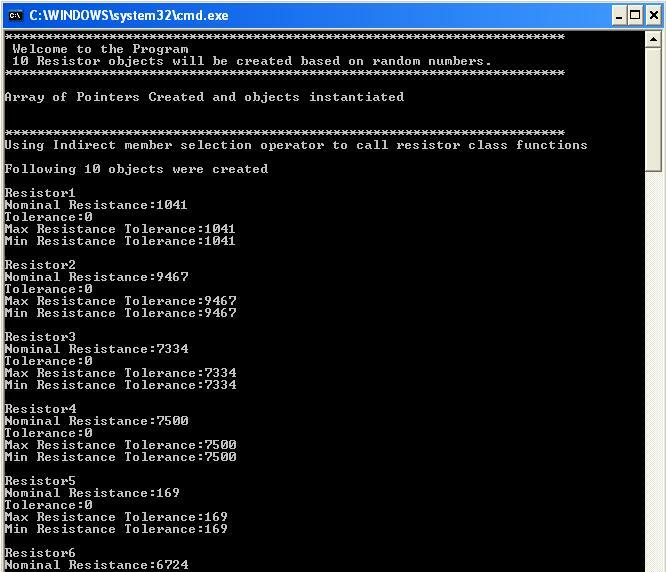 The lab also introduces pointer arrays and pointers to pointers. The Resistor class created in the WeekÂ 2 lab will be usedÂ as the class that the pointer operations will be used upon. The lab also requires the use of accessor functions and static data members, which may need to be added to the Resistor class definition and implementation. 1. Submit a single Notepad file containing the source code for all the files of the lab to the Dropbox for Week 5. Your source code should use proper indentation and be error free.Â Be sure that your last name and theÂ lab numberÂ are part of the file name: for example, YourLastName_Lab5.txt. Each program should include a comment section thatÂ includes, at a minimum,Â your name, the lab and exercise number, andÂ a description ofÂ what the program accomplishes. 2. Submit a lab report (a Word document) containing the following information to the Dropbox for Week 5. •	Include your name and the lab or lab-exercise number. •	Specification:Â Include a brief description of what the program accomplishes, including its input, key processes, and output. •	Test Plan:Â Include a brief description of the method you used to confirm that your program worked properly.Â If necessary, include a clearly labeled table with test cases, predicted results, and actual results. •	SummaryÂ and Conclusions:Â Write a statement summarizing your predicted and actual output, andÂ identify and explain any differences.Â For conclusions, write at least one nontrivial paragraph that explains, in detail, either a significant problem you had and how you solved it or, if you had no significant problems, something you learned by doing the exercise. •	A UML diagram: This should show all classes, class members, access specifiers, data types, and function arguments, along with any and all class-to-class relationships. •	Answers to Lab Questions:Â Answer any and all lab questions included in the lab steps. Each lab exercise should haveÂ a separateÂ section in the lab-report document. 5.	the completeness of your lab report. Create a new multifile project using the Resistor class developed in Week 1, and include a new main() test function. 1. Add a static data member of the class Resistor to keep track of the number of Resistor objects that are dynamically created. This will also be used to limit the number of objects that are dynamically created to the maximum array size of the pointer array in the test function main(). 2. In the Resistor constructor, use a random-number generator to randomly assign a nominal resistance value to the object between 1,000 and 10,000 ohms. The resistance values are not required to be standard resistance values. 1. Create an array of pointers of type Resistor. 2. Use elements of the pointer array to allow the user to dynamically allocate memory and to instantiate objects of the Resistor class. 3. Use the indirect member-selection operator (pointer) in the test routine to access function members of the Resistor class. 4. Write a new, nonclass function called in function main() to sort the pointers to the Resistor objects in order from lowest nominal resistance value to highest, passing a pointer to the Resistor-object pointer as the only passed data argument. 5. Display the sorted Resistor objects according to the nominal resistance value, from lowest to highest. 6. Within the sorting function, use pointer arithmetic to access the individual Resistor objects. 7. Function main() should also ensure thatÂ there are no memory leaks when the program ends.